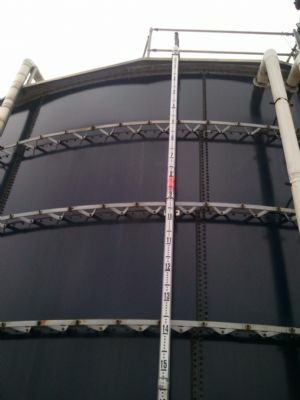 Float-operated, Liquid Level Indicators and Water Level Indicators show the level of the water or other liquid in storage tanks, with an accuracy of ±1". Linear measurement can be supplied to customer's specifications; optional designs are available for all types of storage tanks and special requirements. (Also available in metric measurements.) All interior components are stainless steel. Gauge boards are available in galvanized, aluminum, or stainless steel. 90º elbows are made from A-356 aluminum with stainless steel trim and high temperature pulleys which are made with ULTEM and can withstand temperatures of 400º+. This is a complete water level and liquid level package including all necessary piping for installation. The TUBE style full travel liquid level indicator is based on the same principals at the standard board style level indicator; however we redesigned and updated the conventional level board and marker to a 3.5" polycarbonate tube with an internal marker or indicator. This TUBE does not contain fluid, but rather uses an internal float switch inside the tank, cabled to the neon orange indicator needle. Reduced service calls because the cable for the float switch and indicator are protected from the wind by being sealed within the TUBE. Minimizes alignment issues because the TUBE is coupled together. The round design of the TUBE is resistant to flex, pull, and chatter created in high winds. Nearly indestructible and will not crack or misshape, even under severe impact. Rated to 280 degrees F. Poly blended with Tinuvin 1577 UV protectant to resist weatherization. The material used for the TUBE is the same material commonly used for headlight covers on automobiles, skylights, and even cockpit canopies in fighter jets. 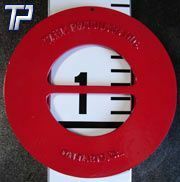 A weather-resistant vinyl scale, with black numerals and intermediate marks on a white background, is mounted on a steel backing. Direct reading scale in 1", 6" and 1' intervals, allows the liquid or water level to be read quickly from a considerable distance. Optional 2:1 compressed scale keeps the level indicator above the reach of vandals. This is also known as a "1/2 travel" indicator. Being located in Ontario, California, Tank Products, Inc., serves the surrounding areas of the Inland Empire such as Upland, Rancho Cucamonga, Fontana, San Bernardino, Riverside, Los Angeles and Orange County. But we are not just limited to Southern California. We ship our liquid level indicators and float switches throughout the US to places like Houston, Texas, Chicago, Illinois, New York, Florida, Ohio, Pennsylvania, Arizona, Minnesota, Louisiana and more. Just about anywhere that water and fuel storage tanks are you will find out products. So please feel free to request a quote, call us with any questions you have regarding our liquid level indicators, float switches and water level sensors.